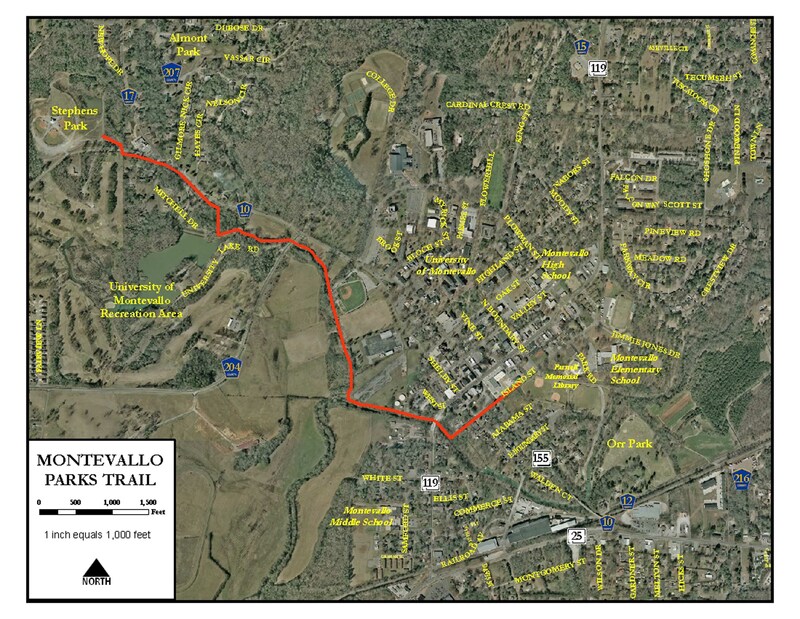 The two-mile Montevallo Greenway Trail connects Orr Park, the downtown business district, the University of Montevallo, and University Lake Recreation Area. Location: In the City of Montevallo, in central Alabama; greenway trail connects several major area features. From Montgomery, AL: I-65 North to Exit 228; Take Left on Hwy 25; Take Left on Hwy 31; Take Right on Hwy 25; At Piggly Wiggly turn Right on 155; Turn Right on Island Street; Orr Park on Right; Parking on left (behind McDonalds). The City of Montevallo is the kind of place most Americans would like to have as their hometown. With a population of about 5000, Montevallo offers the best "small-town" life quality but within only a 45 minute drive of Alabama's largest metropolitan area. With the state's only public liberal arts university, the University of Montevallo, located in the heart of the city, cultural and athletic events are abundant. There is rarely a week without a concert, a play, an art exhibit, or a collegiate-level athletic event. The 1994 census reported that Montevallo had grown by 49% since 1990, making it the fasted growing city in Alabama. The growth has been attributed to a movement away from the metropolitan area of Birmingham into a suburban, family friendly, area that is still easily accessible to the Birmingham area via interstate highway. The two-mile trail begins at the existing Orr Park asphalt walking and biking trail at its closest approach to Island Street near the junction of Island Street and Middle Street. 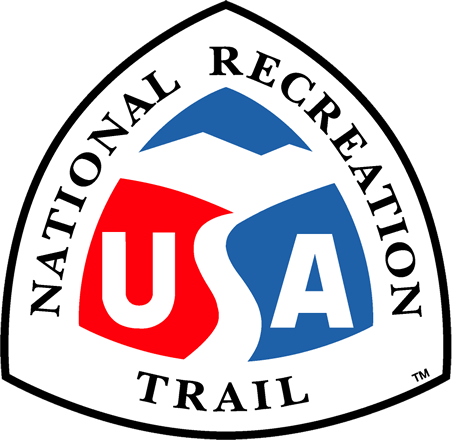 Public restrooms are available along the trail near the beginning of the Greenway. Though the Greenway itself is not wheelchair accessible over the majority of its length, the majority of the Orr Park Trail is. The Greenway is a diverse experience with wooded areas featuring beaver dams and direct access to Shoal and King Creeks, making excellent habitats for muskrat, wood duck and kingfishers. The Greenway features a combination of sidewalks and natural surfaces including some difficult inclines. Walking Description of trail starting at Stephens Park: Total distance Park to Park is about 1.9 miles. Including the lake loop, total distance is about 2.5 miles. Starting at the Stephens Park parking area near Highway 10, follow the paved Stephens Park walking path east (toward downtown Montevallo) to the junction with the gravel surfaced Parks Trail. The beginning is marked by a large brown sign and following the trail takes you down the hill to a crossing of Highway 10 just at the eastern edge of the Montevallo Golf course. 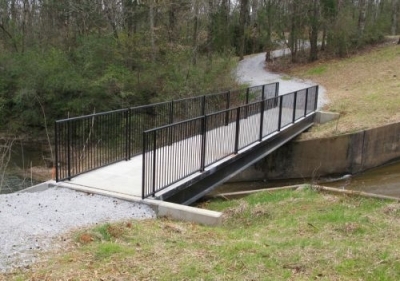 Along the Highway right of way, the gravel trail crosses a quaint and beautiful small arched wooden bridge and then after a few hundred feet, enters University of Montevallo woodlands only to shortly emerge again just at the bridge crossing of the lake spillway. A right turn takes you on a 2/3 mile out and back walk though woodlands overlooking the north side of the University Lake. This spur trail was made using wood mulching equipment that transformed the woodland growth in the trail path into wood chips for surfacing. It includes several gorgeous vistas of the lake. Benches are located at strategic locations for resting and just enjoying the sights and sounds of the seemingly remote wilderness. Back at the bridge, crossing the spillway will bring you close to the sight and sound of Davis Creek accelerating from quiet lake to loud rushing torrent as it falls underfoot and down the spillway. Across the bridge, follow the trail to a crossing of Highway 204. Across 204, go downstream along King Creek on the gravel surfaced trail passing several beaver dams and then cross King Creek over a bridge connecting the soccer fields. After crossing King Creek, continue to follow the trail down King Creek, passing near the paved University of Montevallo Driver Training facilities. Do not cut across the driver training areas but stay on the very clearly marked trail. King Creek junctions with Shoal Creek here and the trail leaves King Creek to follow Shoal Creek upstream, passing the end of Valley Street just past the fenced large tanks of the City of Montevallo water treatment facility. As you continue upstream, the trail crosses the historical Montevallo Spring, passes the ruins of a 19th century bridge pier, and then passes under the Main Street Bridge. A woodland vista of the creek from underneath the bridge shows a series of rapids all the way upstream to an old mill dam visible in the distance. Surprisingly, a hiker almost instantly passes from this wild scene to Main Street Montevallo by following a short connector to the left just past the bridge. Though only a couple of hundred feet long it includes a number of steps so be prepared to climb. Back at the trail, follow the banks of Shoal Creek along the rapids section, rest for a time on the benches along the creek, and then turn left at the junction of the Island Street right of way and the creek. Follow the sidewalk along Island Street to Shelby Street. Across Shelby Creek a sidewalk takes you to Middle Street and, after crossing Middle Street to a junction with the Orr Park walking path and the end of the Parks Trail. Orr Park offers residents and visitors an opportunity to "get back to nature", to play organized sports, to use a variety of park equipment, to have family picnics, and to engage in just about any other imaginable outdoor activity. Beautiful Shoal Creek meanders through Orr Park providing opportunities for fishing, wading, canoeing, kayaking, and just "watching the creek roll by." A paved walking trail follows the creek for much of its journey through the park. In 2003, Shelby County provided the City with some exciting enhancements to the park. The brand new playground equipment and restrooms tie for favorite among parents and children. Several paved walking paths continue through Orr park, along Shoal Creek and through Tinglewood, an enchanted woodland where wizards, gnomes, animals and other fantastic creatures show themselves when least expected. Be on watch for them! Local artist Tim Tingle has given the dead cedars in Orr Park a new life by transforming many of these ancient tree "stumps" into intricate wood carvings. Mr. Tingle created these sculptures as a gift for which the City is grateful. The walking trail is adorned with an ever increasing number of carvings like this dragon. Park visitors marvel at this unique art form and enjoy the creativity and gift of Tim Tingle. Montevallo is known for its tree-lined streets and friendly faces. It's difficult to be a stranger in Montevallo for long. The people of Montevallo welcome new students and new neighbors, to both the University and to the community every year. If you are searching for a great place to be, a great place to go to experience college-life, a warm and safe place which nurtures family life, or just the best possible hometown; you will never find a better place than Montevallo! Montevallo was incorporated in 1887, and gets its name from a Spanish word meaning "Limestone". Before its incorporation, the town was known as "Lime Kiln Station", because of its location in the heart of the great lime producing section of Alabama. This area is one of the largest chemical lime producing areas in the United States. Lime produced here is shipped all over the southeastern U.S. and into some foreign ports. Two Heads by Tim Tingle. Photo by Andrew Cost. Sage Creek Trail tree carving by Tim Tingle. Photo by Andrew Cost. Andrew meets a gnome. Photo by Hollie Cost. Boys with lion carving by Tim Tingle. Photo by Andrew Cost. Snakehead wood sculpture by Tim Tingle. Photo by Andrew Cost.